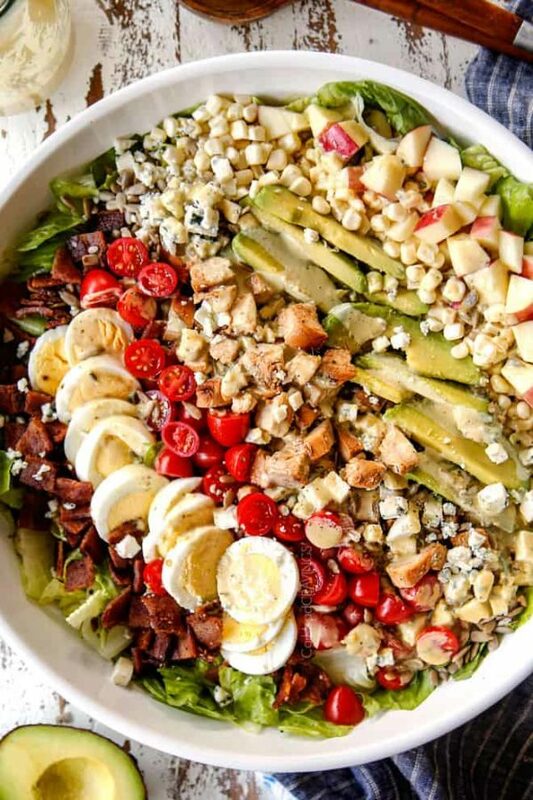 Cobb Salad loaded bacon, avocado, tomatoes and honey mustard chicken with a marinade that doubles as the dressing for no extra work! 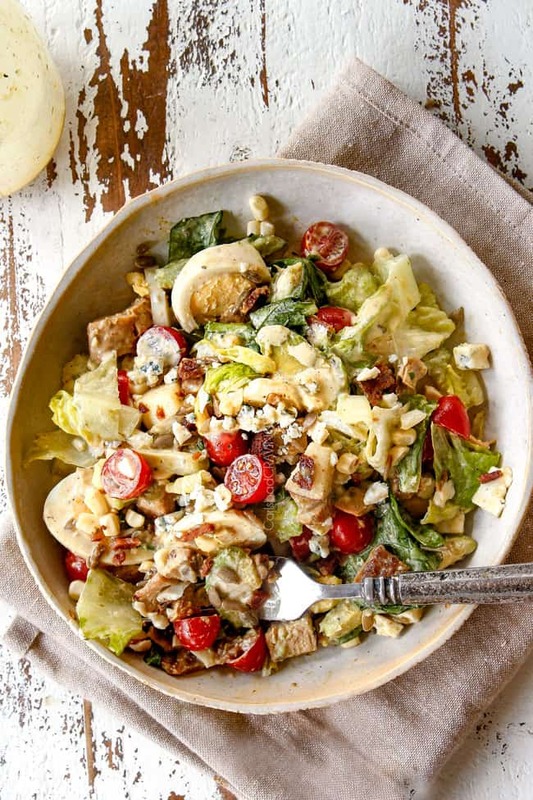 This Cobb Salad recipe is easy to make and is the ideal hearty yet light, satisfying lunch or dinner. You can prep all the ingredients ahead of time so it can come together in a flash! 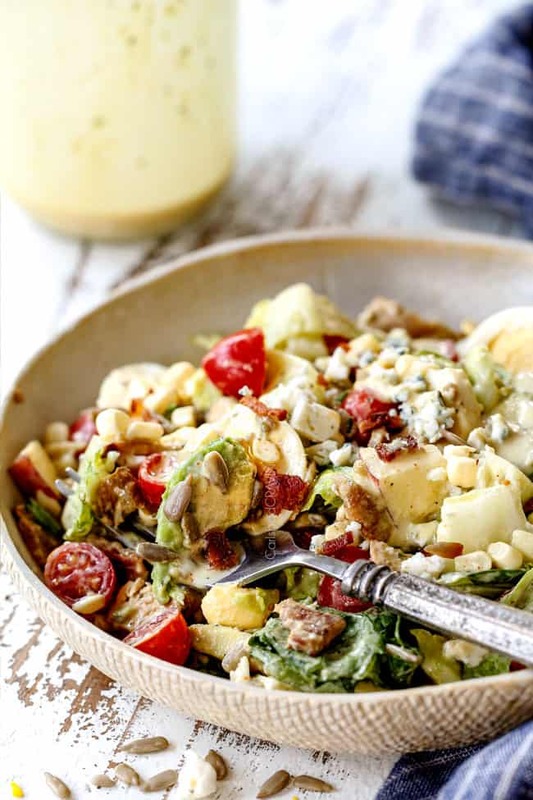 This Cobb Salad is bursting with crispy lettuce, fresh corn, honey mustard chicken, salty bacon, hearty eggs, creamy avocados, juicy tomatoes, tangy blue cheese, fresh apples and crunchy sunflower seeds all doused in Honey Mustard Dressing. It is everything you love in one tantalizing plate! When salads are done right AKA loaded with crunch, nuts/seeds, cheese, and a killer dressing – it doesn’t get much better. From my Teriyaki Chicken Salad with Pineapple Sesame Dressing to my Caprese Chicken Salad with Creamy Balsamic Reduction Dressing to my upcoming Chinese Chicken Salad, I could eat salad for daysssss. This restaurant delicious Cobb Salad allows you to enjoy the deliciousness that is Cobb Salad any time of day, any day of the week. 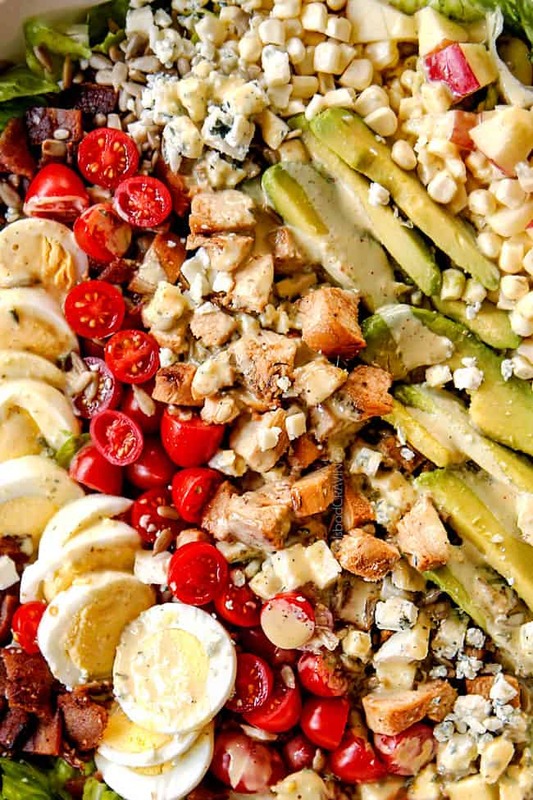 I knew this Cobb Salad recipe would be good, but this recipe is beyond good, it is exploding with satisfying texture and flavors in every bite. I wanted to make this this quintessential American Cobb Salad even more delicious so I’ve added juicy, sweet and tangy Honey Mustard Chicken. 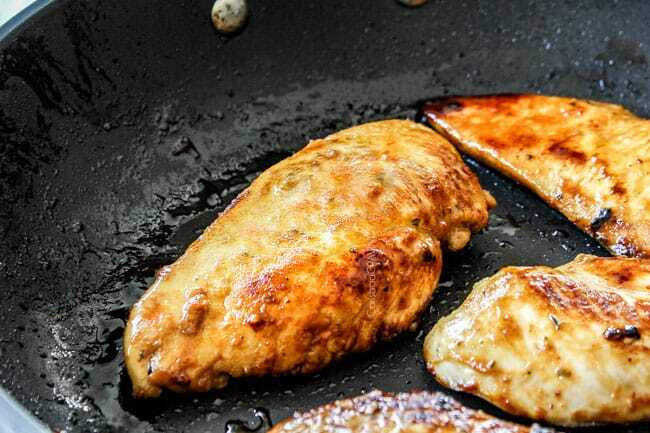 I slightly adapted my readers favorite Cajun Honey Mustard Chicken recipe to create the chicken and bonus – by creating a marinade for the chicken, we also create our dressing! If you are short on time, you can also swap the chicken for rotisserie chicken and coat it in some marinade, but that and much more is all in my Tips and Tricks Section below. So let,’s get to it! What is in a Cobb Salad? I’ve kept all these ingredients in my Cobb Salad recipe (with the exception of the red wine vinaigrette) and added a few of my own to make this the BEST Cobb Salad! The chicken is crazy flavorful and the dressing is sweet, tangy and lusciously creamy. I’ve also added a sweet apple (like Fuji or Honeycrisp) which plays beautifully with the tangy dressing and pungent cheese and sunflower seeds, because every salad needs cheese and because sunflower seeds are always a good idea. Where Does Cobb Salad Come From? “One night in 1937, Bob Cobb, then owner of The Brown Derby, prowled hungrily in his restaurant’s kitchen for a snack. Opening the huge refrigerator, he pulled out this and that: a head of lettuce, an avocado, some romaine, watercress, tomatoes, some cold breast of chicken, a hard-boiled egg, chives, cheese and some old-fashioned French dressing. He started chopping. Added some crisp bacon — swiped from a busy chef. “The Cobb salad was born. It was so good, Sid Grauman (Grauman’s Chinese Theatre), who was with Cobb that midnight, asked the next day for a ‘Cobb Salad.’ It was so good that it was put on the menu. What is the difference between a chef and a Cobb salad? Cobb Salads and Chef Salads are very similar. They both contain lettuce, avocados, tomatoes, and hard boiled eggs. Where they vary is that Cobb Salads also contain bacon, blue cheese and chicken. Chef Salads, on the other hand, usually boast more than one variety of julienned meats from ham, to turkey, to chicken, or roast beef. Cucumbers are also common with Chef Salads. Chef Salads can be served with a variety of dressings whereas classic Cob Salads are served with red wine vinaigrette. How do I make Cobb Salad? 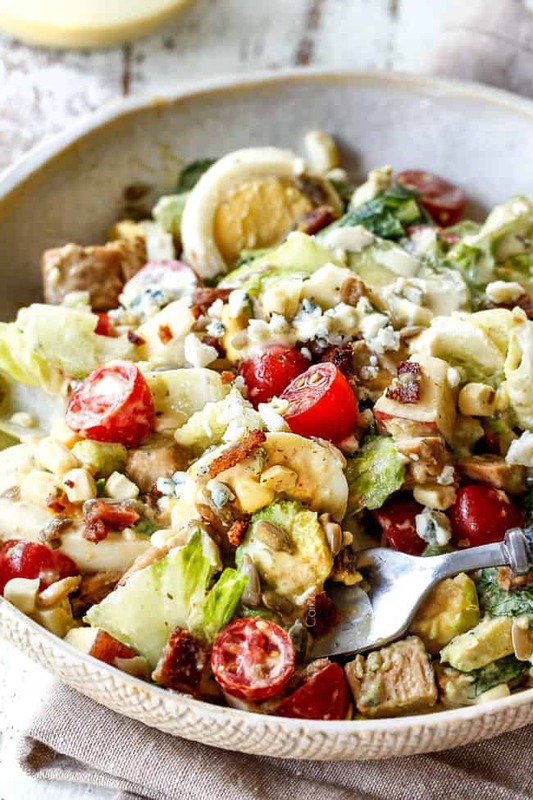 Cobb Salad is all about the layers of flavor and texture of the toppings and then just tossing them together! Romaine. We want crunchy romaine as the base of our Cobb Salad recipe. Discard any flimsy leaves. You can also use a combination of half romaine and half iceberg lettuce. Tomatoes. I use grape or cherry tomatoes because they have less watery flesh than Roma tomatoes and are the perfect bite-size juicy morsels when halved. Cherry tomatoes are inherently sweeter than grape tomatoes, so aim for cherry if you can. Avocado. Use ripe avocados but not overly ripe or they will turn to mush. To tell if an avocado is ripe, squeeze it gently. A ripe avocado should yield slightly to pressure but not feel overly soft. If your avocados ripen before you are ready to use them, they can be stored in the refrigerator which will dramatically slow down the ripening process. Chicken. I use store-bought chicken fillets but you can also use two large chicken breasts and cut them in half lengthwise to make four thin fillets. You can also use chicken thighs if you prefer. Hard boiled eggs. These are essential to call it a “Cobb Salad.” Even if you aren’t sure you love hard boiled eggs, give it a try, I think you’ll be surprised how delish they are! You may need to google “How to Make Hard Boiled Eggs.” I have found methods that work for some don’t work for others. For me, I fill my small pot rim to rim with eggs so there is no room for them to rattle around and break. I then fill the water so it is almost covering the eggs. I bring the water to a boil then reduce the temperature to low for 10 minutes. Next, I remove the eggs from the heat, cover and let sit for 5 minutes. At this point, I sacrifice an egg to see if it’s done, if not, then I cover the eggs for another 5 minutes or so. 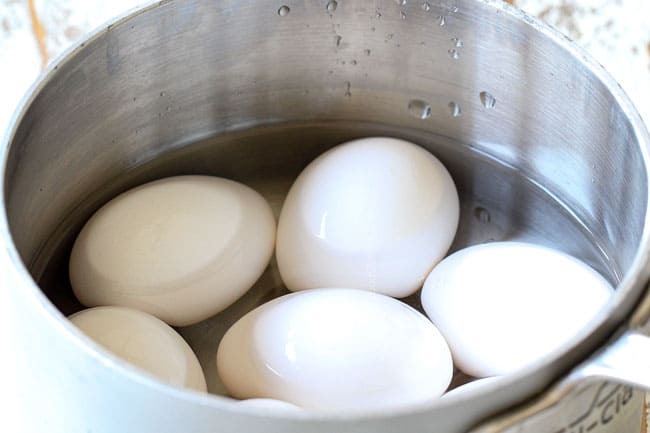 Once done, immediately rinse eggs in cold water to keep from cooking. What’s YOUR best method for cooking eggs?! BACON. I highly recommend thick-cut bacon so its wonderfully meaty texture doesn’t get lost in the salad. BLUE CHEESE. Use more or less blue cheese depending on your blue cheese love. If some of your partakers aren’t blue cheese fans, then leave it out and make a few different cheeses available for garnish. You can also completely substitute the blue cheese for your favorite cheese. CORN. Corn is another one of my additions to classic Cobb Salad and it adds a wonderfully, sweet, fresh crunch. If you have never had corn fresh off the cob without grilling or cooking- it is fabulous! APPLE. I highly recommend a sweet apple like Fuji or Honeycrisp. Their sweetness and fresh crunch beautifully compliment the other earthy ingredients and are one of my favs with cheese. SUNFLOWER SEEDS. 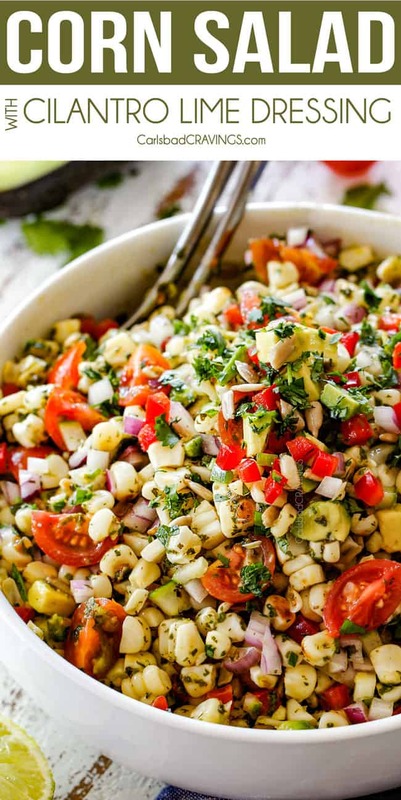 Sunflower seeds are delish on their own and make every salad better. I just pick some up at the bulk section of Sprouts so that way it’s easy to control the quantity. What kind of dressing do you put on a Cobb salad? Red Wine Vinaigrette is typically served with Classic Cobb Salad. While delicious, we are going to get fun and flirty and use Honey Mustard Dressing. 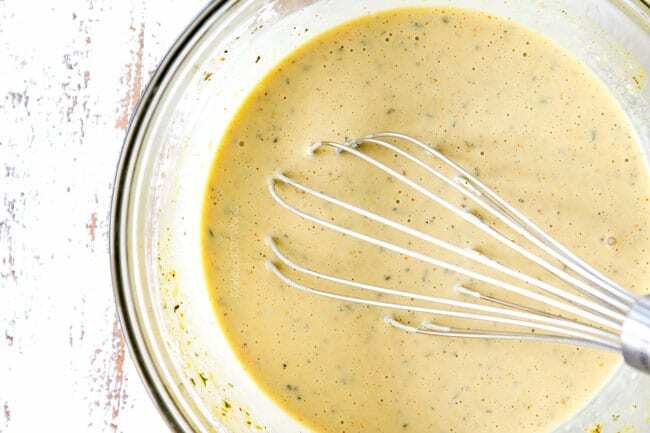 The Honey Mustard Dressing achieves the same tang factor provided by red wine vinaigrette – but it is tantalizingly creamy with the addition of mayonnaise and Greek yogurt, with a depth of flavor from both yellow and Dijon mustards, honey and brown sugar, orange juice and seasonings. Chicken substitute. You can use a rotisserie chicken and toss it with some of the honey mustard marinade to taste. You can also substitute chicken with shrimp. You don’t have to make a salad! 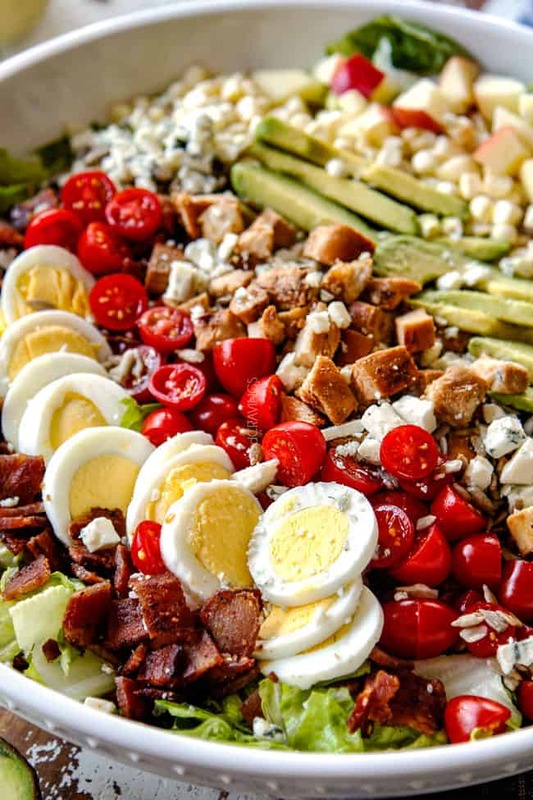 The fixings of this buffalo Cobb Salad are fabulous in wraps and sandwiches as well. Customize ingredients. The salad ingredients and measurements are simply suggestions. You can use add/swap any ingredients for your favorite veggies. Salad Bar. If you area hosting friends then a salad bar is always a fun idea so everyone can add more or less of their favorite ingredients. Prep ahead: You can make your chicken, chop all your veggies and make your dressings ahead of time and store in air-tight containers in your refrigerator so all that’s left is to add your avocados and apples. You will be loving life when your hangry if you do this! 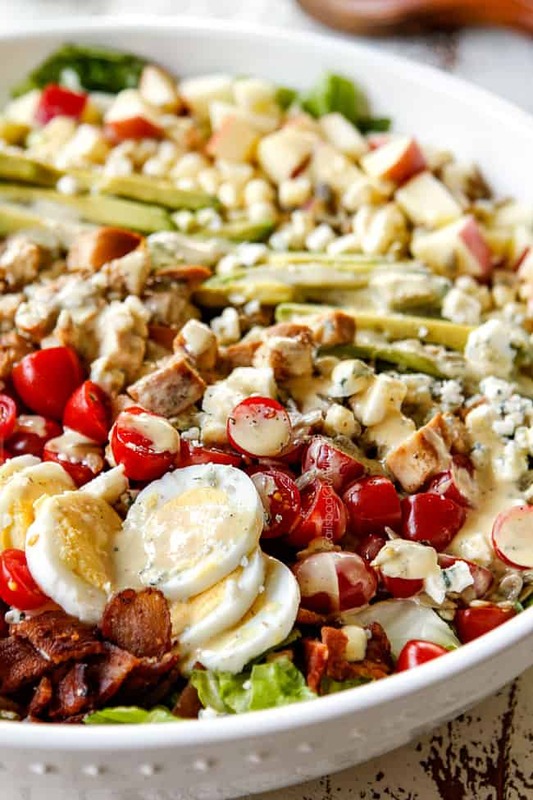 Want to try this Cobb Salad Recipe? Pin it to your Salad, Chicken or Dinner Board to SAVE for later! Cobb Salad loaded with all your favorite fixings and drool worthy honey mustard chicken with the marinade doubling as the dressing for no extra work! 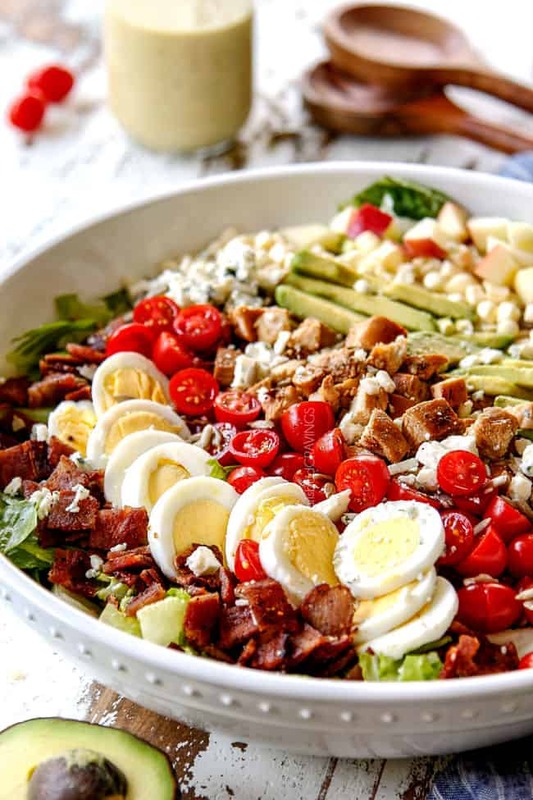 This Cobb Salad recipe is easy to make and is perfect for a hearty yet light, satisfying lunch or dinner. You can prep all the ingredients ahead of time so it can come together in a flash! In a medium bowl, whisk Honey Mustard Marinade ingredients together. 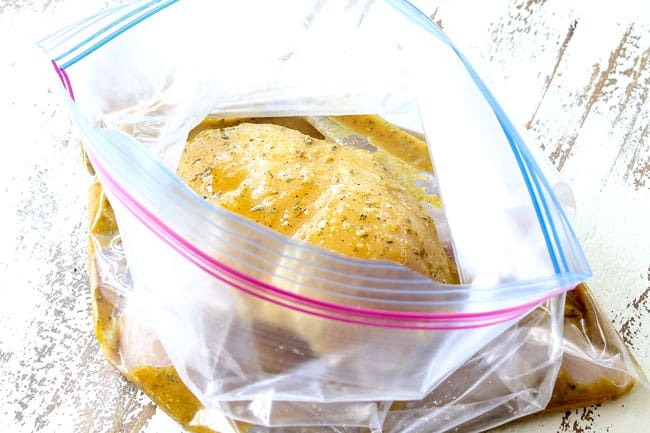 Add 1/2 cup of marinade and 3 tablespoons olive oil to large freezer bag along with chicken. Marinate at room temperature while you prep your veggies up to overnight in the refrigerator (the longer the better). To remaining marinade, whisk in 1/2 cup plain Greek yogurt or sour cream and 1/2 cup mayonnaise. Cover and refrigerate. Heat a large non-stick skillet over medium high heat. Once very hot, add chicken and cook, undisturbed for 3-5 minutes, or until nicely browned on one side. Turn chicken over, cover, and reduce heat to medium. Cook for approximately 3-5 more minutes (depending on thickness of chicken), or until chicken is cooked through. Remove to a cutting board and let rest 5 minutes before chopping. Layer lettuce on a large platter or bowl. Arrange ingredients on top of lettuce as desired. If serving immediately and don’t expect leftovers then drizzle desired amount of dressing over salad and toss. If you expect leftovers then hold dressing and drizzle individual servings with dressing so the salad doesn’t get soggy. Store leftovers without dressing (aside from avocado), tightly covered in the refrigerator for up to 4 days. I am so excited to try this Jen! I already known it’s going to be a winner because your Cajun Honey Mustard Chicken is a favorite at our house. 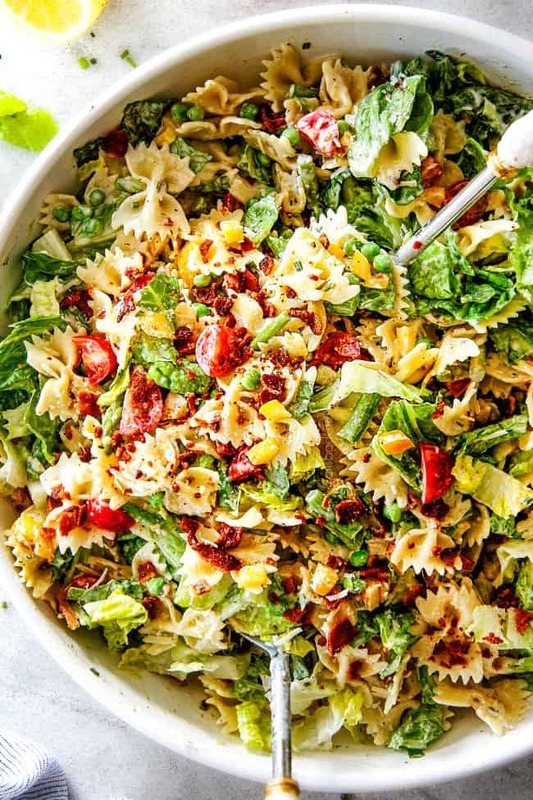 We tried yiu Cowboy Pasta Salad yesterday for a potluck and it was the first thing gone! Thanks for all the hard work you put into your site, our family has never eaten better! Thank you for your kind comment Dennis, it makes me so happy to hear your family is enjoying my recipes! That is awesome you are already a fan of the Cajun Honey Mustard Chicken – you will especially love this then – it’s like that but on steroids with all the goodies :). 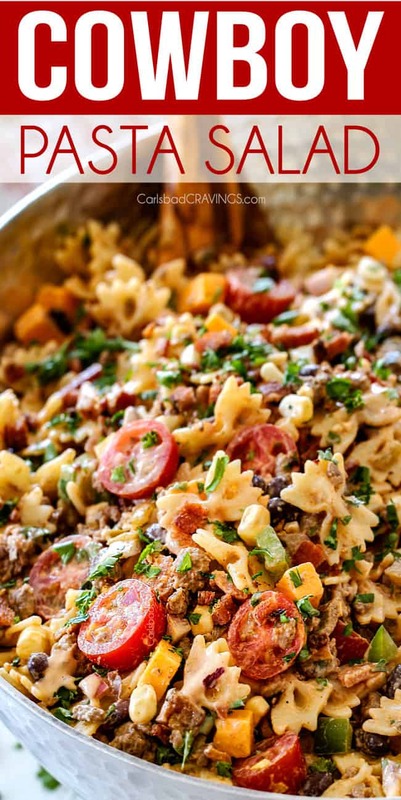 I’m so glad the Cowboy Pasta Salad was such a huge hit! I am going to miss salad season! This slalad is gorgeous! I want to make everything you post, and have loved everything I’ve tried. Keep the recipes coming! Thanks Jen for the recipe. I love Cobb salads but never had one with the addition of fruit other than tomatoes and avocados. And I always heard the classic dressing for a Cobb salad was Bleu Cheese! I love to read your comments about all your beautiful recipes. They always make me want to take a bite out of my computer screen! You are a Super Woman-I don’t know how you do it all but thanks for sharing so freely with all of us. Perfect for my office lunch ! Thank you ! You are so welcome! 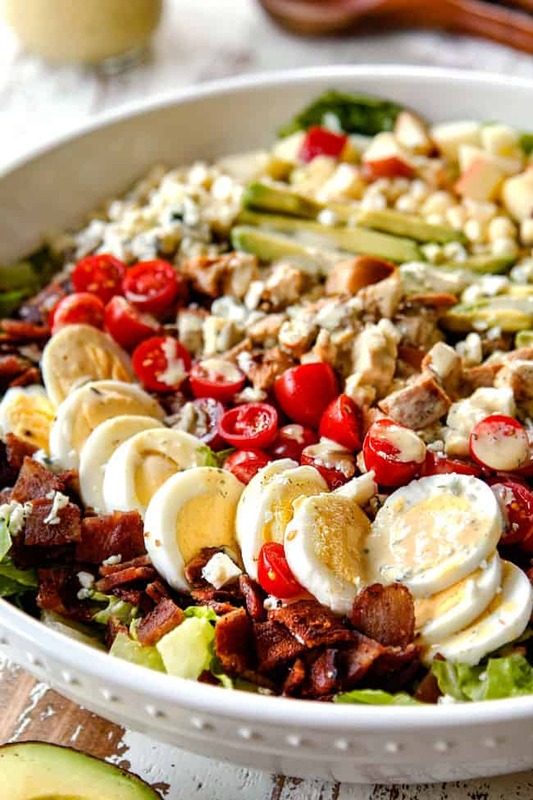 Love the idea of this Cobb Salad for office lunch- yum! I made this last week….absolutely delicious!! Thanks for taking the time to comment! I’m thrilled you loved it Tamra, thank you! Definitely going to try this recipe next time I head to the store! Thank you for sharing! You are so welcome! I’m excited for you to try it! Made this tonight and it was fantastic! The flavors complimented each other well. Yum! Thanks for another great recipe. Yay! I’m thrilled it was a winner! Thanks so much Tracy!